Direct from the brand new Coopers Maltings plant to you in the latest second generation reinforced bag. The lightest coloured malt, Coopers Premium Pale Malt is well modified and perfectly suited for single step infusion or for decoction mashing. 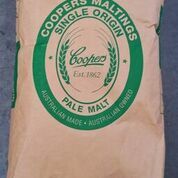 Coopers Premium Pale Malt carries sufficient enzymatic power to be used up to 100% as a base malt.